Submitted by HS on Fri, 2011-03-18 12:55. Submitted by HS on Fri, 2011-03-18 12:57. 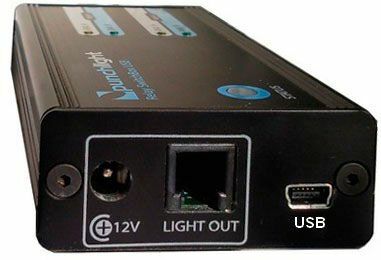 The Relay SwitchBox USB is a small USB powered unit with two built-in switching relays. The unit can control any signalling systems already installed in the studio. You can control any other device, e.g. speakers, a microphone or even your own light system via just one small box. 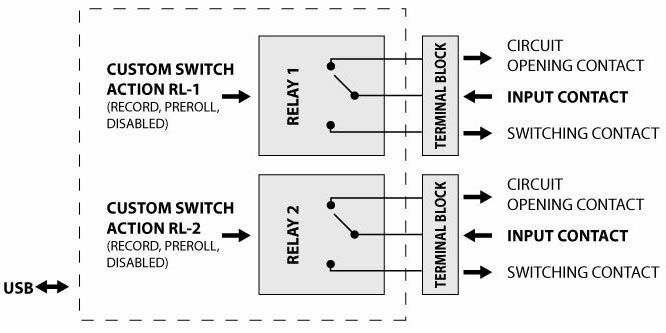 The Relay Switch Box USB can work without a power supply, as it is connected and powered via just a 5V USB port. The Relay SwitchBox USB is designed for anybody working in project, dubbing, or post production studios who needs visual confirmation of when a recording begins or ends. This simple, precise and easy to use device is perfect for musicians and sound engineers as well as film, tv and video editors. It is easy to install in any studio environment. It is possible to connect an additional external light, such as the RECORDING Display, RECORDING PlexSign, RECORDING Ring or RECORDING Lamp. A 12V power supply is needed in this case. The 12V PSU is not supplied in the package. The unit is compatible with most audio applications such as Pro Tools, Cubase, Logic Pro, Digital Performer, Samplitude, Reaper, Sonar, Vegas Pro. automaticaly sends information about Recording start/stop and record "ready" to the Relay Switch Box USB. Submitted by HS on Fri, 2011-03-18 12:58.